At the end of March, the clocks spring forward, confusing us all and angering those of us who value our morning lie in. But why do the clocks change twice every year? We’ve put together a few resources that could help you tackle the topic of time, a subject that has perplexed and inspired some of the world’s greatest thinkers and scientists for thousands of years. What time is it now? The Time.is website provides an easy way to find out what time it is around the world. Calendars loom over our lives: how many days till the weekend, the next holiday, Summer, Christmas? But finding a calendar that worked took millennia. If you’re interested enough to do some extra reading, this book is an excellent place to start: The Calendar: 5000 Year Struggle to Align the Clock and the Heavens, and What Happened to the Missing Ten Days. For a quicker introduction you could try this short clip: The Curious Modern Calendar Invention or this slightly longer explanation: A Short History of the Modern Calendar. Despite the Gregorian calendar being the best system we’ve managed to come up with, we still need to add an extra day once every four years. A simple explanation of leap years is given in this clip: What is a Leap Year Exactly? You could hardly have missed that the world was meant to end in December 2012, and yet here we all are still! An explanation as to why from NASA: Beyond 2012 – Why the World Didn’t End. You can find a useful visual to show different time zones on the Timeticker website; and there is also a short video from the BBC – A brief history of time zones. The British Council have created a story resource, One moment around the world – to demonstrate what children around the world might be doing at 5pm UK time. The storybook One Day explores time zones by following 15 different children from around the world through a 24 hour period. The author, Suma Din, has also written a blog about it for us. The Youtube film Life in a Day shows life around the world during one 24-hour period using video uploaded by thousands of people. If your students are studying business or economics they might be interested to know that financial markets are ‘shifting’ time, as increasing numbers of people across the world are working in-sync with different time zones: Forex Market Hours. On the right is an interesting approach to teaching pupils to tell the time, as tweeted by @tesResources! A symptom of modern life is feeling like there is never enough time; hand-in-hand with this is our desire to measure it – a task that hasn’t always been as simple as it is today. TED-Ed have produced a clip on The history of keeping time. Follow the ‘Dig Deeper’ link for more resources. Benjamin Franklin is credited with coming up with the concept of Daylight Saving Time. The basic idea is to make the best use of daylight hours by shifting the clock forward in the Spring and backward in the Autumn. You can find a six minute video clip explaining daylight saving on YouTube: Daylight Saving Time Explained. Some of the big ideas about time are incredibly complicated but they can also be incredibly fun to try and get your head around. Why not challenge your students with these theories? Lots of philosophers have thought about time; Zeno’s paradoxes could be used even with primary students (as ideas, not the Maths part! ): Zeno’s Paradox of the Tortoise and Achilles and Zeno’s Dichotomy Paradox. Eternity: Hendrik van Loon, in his book ‘The Story of Mankind’, had an interesting description of eternity based on the idea of a little bird sharpening its beak on a huge rock – this is explained and explored on this page: The little bird of Svithjod. Time is a fantastic concept to discuss with children during a Philosophy for Children (P4C) style enquiry. Your stimulus could be as simple as a picture linked with time or a fictional story. Encourage children to generate questions or ‘wonders’ based on this stimulus. Why does time sometimes pass quickly and sometimes slowly? What would life be like without time? Does time need to exist? We might constantly be watching the clock but is this true everywhere in the world? Some interesting blogs on ‘African time’ help provide a comparison to the ‘daily grind’ we might experience in the UK. This blog – African Explanations – introduces the concept of ‘African time’ and could provide interesting material for a classroom debate on attitudes towards and challenges in cross-cultural interaction. A blog from Nigeria exploring how time can link to ideas of development and underdevelopment: What Is ‘African Time’? You can explore a few more different cultural attitudes to time on the A Matter of Time website (this is actually great website for exploring many aspects of time). 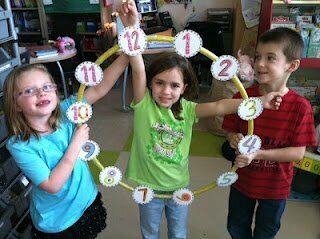 Do you have any further ideas or suggestions for teaching about time? Let us know in the comments box below! The photo at the top of the page is The Passage of Time by ToniVC on flickr.com and is used under a Creative Commons Licence.